NMM 10,042. 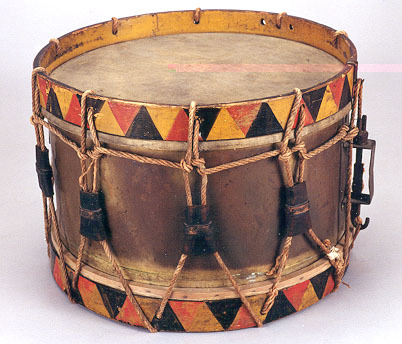 Side drum, France, ca. 1850-1900. Stamped on the strainer: ΔН / 290. Brass shell, 283mm (11-1/8") x 404mm (15-7/8"). Rope tension. Nine leather tugs. Wood rims painted with yellow, orange, and black triangles, with holes through which the rope passes. Brass snare adjuster. William F. Ludwig II Collection, 2001.